Get your coworker on board rather sooner than later. To add new users go to the Locations tab and click on the location's name you wish to add the new user to. Then go to the USERS tab and click on the green button +Invite. Please note that only Location Manager, Administrator, or Account Owner can add other users. The basic information of name and email is required for the system to send the invite. The users will set their own passwords. When you have more than one location, you can limit the user's role to a specific branch and within that branch determine the access level they have. 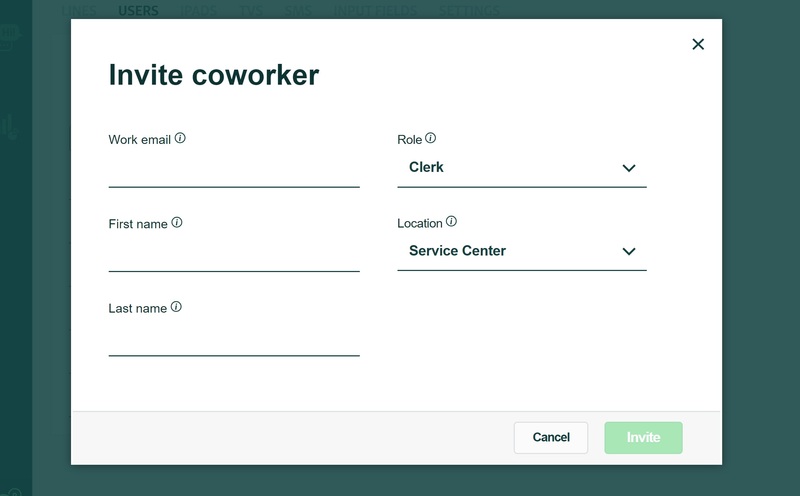 To change your coworker's role, click on that user's name and then add/remove roles as needed. To delete the user, click on that user's name and then click Edit and then Delete. Assigning the correct role to your worker is vital because each role serves a different purpose. From the Overview tab clerks can view data from the current day or the day before. From the Data Insights tab clerks can view visitor history. LOCATION MANAGER users have the ability to configure workflow and look at statistics. From the Overview tab location managers can see data from the current day and the day before but also data from the previous week. From the Data Insights tab location managers can view visitor history and statistics (visitors, performance, clerks). 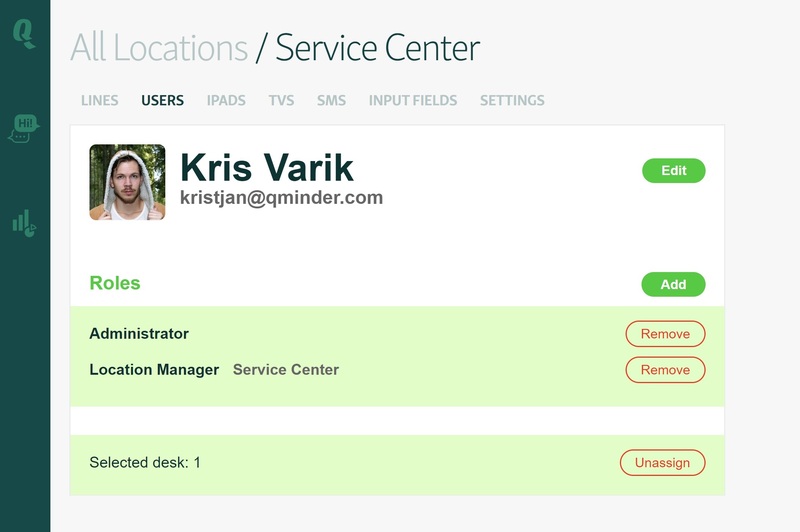 From the Locations tab location managers have a wide variety of options to manage queue service and Qminder setup. ADMINISTRATOR users have all the capabilities of location managers. In addition, they can add and remove locations and have access to Account Setup and Billing settings. OWNER user is like an administrator user but cannot be removed by any other user role. Clerks and location managers are restricted to the specific locations they have been assigned to. Administrator and Owner users are not limited to any location and can freely switch between all of the available locations.